I’m not sure when it was exactly. Or where for that matter. Some coastal town where the family retreated for a holiday. Ramsgate, Broadstairs or Margate? Maybe Portsmouth? There was a pub that provided an element of shelter on a rainy evening with a family room that provided a joyful step back in time. Apart from a lemonade and a packet of salt’n’shake crisps, the real treat was that they had piles of Mad magazines and Power Comics. It might well have been my introduction to Alfred E Neuman, Spy vs Spy, Don Martin, et al, but Power Comics were already a thing of nostalgia. It seemed like an age since they had graced a newsagent’s counter. Which might be where you say what’s a Power Comic when it’s at home? To be fair, the first one wasn’t. Nor was the second one. At least not to begin with. UK publisher Odhams Press had previously purchased the Eagle range from Hulton and seemed to be in an expansionist fame of mind. In 1964, they poached Leo Baxendale, Ken Reid and other comic artists from DC Thomson to create Wham! This was a gravure weekly, primarily a rival to Thomson’s Beano and Dandy, and it birthed an assortment of humorous characters such as Eagle-Eye, Super Spy, Frankie Stein, General Nitt and his Barmy Army, George’s Germs, Pest of the West and others. There were a couple of light adventure strips thrown in for good measure (notably Johnny Straight by Don Lawrence, though this was a re-fried reprint of Wells Fargo from Swift). Over the next three and a half years Wham! would clock up 187 issues. This glossy rival to The Beano obviously went down well with readers because in 1966, Odhams launched a sister-publication, called Smash! It was printed on rougher paper than Wham! but featured a similar mix of characters, Eagle-Eye’s arch-nemesis Grimly Fiendish broke out into his own strip. Bad Penny, The Nervs, Charlie’s Choice, the original Danger Mouse, The Swots and The Blots, and others were on hand to give us a chuckle. But a ringer entered the arena with the 16th issue. Well, they warned us. The Incredible Hulk was waiting inside with the first installment of his origin. Dr Banner made his cover debut the next issue, a slightly pink rather than grey or jade giant. Actually, if the Hulk was going to find a home anywhere, it had to be in a comic called Smash! There would even be a specially drawn UK-only installment. Odhams had obtained the rights to reprint Marvel comic material in the UK. A number of strips had already appeared in titles from Marvel Man publisher, L.Miller & Sons and US originals had spotty distribution in tobacconists and newsagents. But the Hulk was now breaking ground in a mainstream weekly. The Power Comics adopted a Stan Lee-style Bullpen page with “Alf and Bart” or “Alf and Cos” whipping up the fan fever amongst readers. Alf was Odhams Editor Alf Wallace, Bart was Bob Bartholomew, the moonlighting editor of The Eagle and Cos, Albert Cosser was a future editor of listings mag, TV Times. A couple of months later, The Fantastic Four would join the line up in Wham! in issue 112 which had ditched the glossy paper in favour of the usual bog paper. All was right in the world, so what do you do. Obviously, you launch a third comic. In January 1967, we were introduced to Pow! which headlined the Amazing Spider-Man but also featured Nick Fury, Agent of SHIELD (which would alternate with Sgt Fury and his Howling Commandos). Humour was provided by Wee Willie Haggis, Dare-a-Day Davy, The Dolls of St Dominics, The Group, while a couple of fantasy adventure strips rounded out the mix. This is the point that all three titles acquired a little logo,(top left) a fist punching through a ring that declared them to be “Power Comics”. And just to make things interesting, Smash! picked up a new cover feature - Batman & Robin. Guess what was on television at the time. Hot on the heels of Pow! came Fantastic in February 1967, not glossy, but printed on better stock than its sister papers, it gathered The Mighty Thor, Iron Man, and the X-Men along with a strange Hulk-like creature, The Missing Link, drawn by Spanish artist Luis Bermejo. This serial would take a bizarre turn in a later issue. This new title was a hefty ninepence and we were not finished there. In April 1967, we gained another Power Comic. This was Terrific which featured The Avengers, Doctor Strange, Giant Man and Sub-Mariner and an adventure strip ostensibly following Don Starr, variously titled, The Living Dolls, Appointment with Fear, Doom, etc. We got an iron-on Iron Man transfer in the first issue which I must have worn ragged when it was put on a t-shirt. These two titles are also noted for featuring early pin-ups drawn by Barry Windsor-Smith before he ventured Stateside to work for Marvel. It’s easy to pin what happened next on poor sales, but other factors were also at play. In the background many UK comic publishers had been falling under a single ownership. Odhams, Amalgamated, City, were all now part of the newly formed IPC. Initially they were left to their own devices but big changes were on the horizon. Over the next five years or so, those individual comic ranges would be subjected to a “rationalisation” programme. I’m not sure it improved things for readers but it obviously made sense to the accountants. The Power Comics line began to unravel. Perhaps we had reached peak Marvel? Some people will point to economic crisis and the devaluation of the pound. And to be fair, why spend 9d on Terrific when you could buy The Beano for 3d? There was a crisis with the printer, solved by some hasty dashes to Poole in Dorset. After 187 issues Wham! was closed and merged with Pow! in January 1968. Then in February that year Terrific (43 issues) was folded into Fantastic. Come September 1968 Pow! and Wham! (Pow! 84 issues) was merged with Smash!. Come November Fantastic (89 issues) was merged with Smash! and Pow! The last man standing, Smash! and Pow! incorporating Fantastic plodded on with a mix of humour strips, notably Mike Higgs’ The Cloak, some adventure strips, a few Marvel features and Batman and Superman. It proudly declared itself to be the comic with Spider-Man and Superman, years before Marvel and DC saw the value in a team up. (OK, they were on different pages). After awhile, Pow! vanished from the title and it became Smash! once more with a discreet “incorporating Fantastic” in the masthead. The superhero features began to wind up and new adventure strips such as Sergeant Rock - Paratrooper (not him) were introduced. The Swots and Blots dominated the cover. Then with the 163rd issue in March 1969, the title underwent a savage metamorphosis. The cossacks rode in with a new masthead and a swathe of new features. While the original Smash! had been pitched as reading material for boys and girls, the new version was a male only province. It was now “Britain’s Biggest Boy’s Paper”. I suppose obesity was a problem even then. To be fair this was where they introduced The Adventures of Janus Stark which followed the exploits of a Victorian escapoligist (which inspired Grant Morrison’s Vertigo series Sebastian O). It also brought forth mystic investigator Cursitor Doom (who I have no memory of even though I was agosh with the changes wrought on Smash! that week. Other features included Master of the Marsh, World-Wide Wanderers, Rebbels on the Run and His Sporting Lordship (strangely funny). Janus Stark and His Lordship were the characters which would endure. 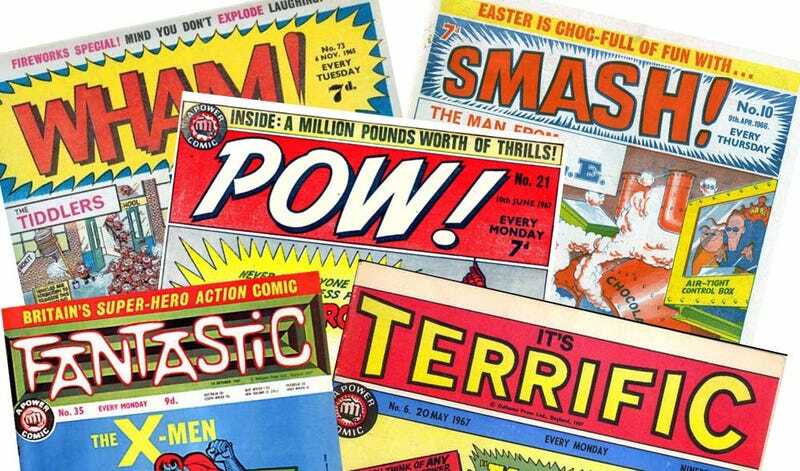 For many UK comic readers, the Power Comics range will be remembered as the place where they first encountered Marvel characters. There were some quirks in Marvel’s presence in Great Britain around that time. The Lee-Kirby Tales of Asgard had featured in Eagle but didn’t survive the merger with Lion. The Amazing Spider-Man washed up with Ghost Rider, Silver Surfer, Ringo Kid and Homer The Happy Ghost in TV21. Was there ever a more uncomfortable fit than than that? It’s strange, but some readers objected to the introduction of Marvel material into Wham! and Smash! Now we missed it. And the TV21 line up was just wrong, now there was a comic in its death-throes. The UK’s King of the Comics has died.